It's only December 2006, but already the media is abuzz with speculations about the Presidential elections of 2008. One of the reasons I’m living abroad right now is that I wanted to take a break from the ridiculous levels of partisanship that American politics has reached in recent years. But as I skim through my favorite media outlets, I’ve been surprised at Slate’s constant hammering away at presidential contender Mitt Romney’s religion. Romney is undeniably jockeying for a presidential run, trying to woo the religious Right with a tough stance on gay marriage and abortion. While he is now trying to defend his conservative credentials after the media exposed that he was previously much more liberal on these issues, Slate.com continues to hammer away at Romney’s Mormonism. I would like to offer a critique of those who are sliding in attacks against Mormonism through the lens of critiquing Romney, from the perspective a queer Christian whose faith is often attacked based on the politics of my more conservative co-religionists. First, the necessary disclaimers: I do not support Romney’s politics or him as a person. In my opinion from the media I’ve followed the last few years, he’s a political opportunist who has had his eyes on the Oval Office for quite a while. As a politician, he’s as smarmy as they come. Additionally, I’m not a Mormon and do not claim to be an expert on Mormonism. I’ve read a fair bit about it, and once tried, for my own edification, to read through the Book of Mormon, but didn’t get very far. Most of my knowledge of Mormonism comes through my many Mormon friends, efforts by many of those friends to convert me, and secondary literature. Even though I would oppose Mitt Romney for any political office and even though Mormonism doesn’t speak to my own religious experience and intuition, I still feel that as a queer Christian I need to speak out against the bashing of any religion. I value my ability to have virtually limitless options of political views, religious beliefs, and ways to integrate the two. 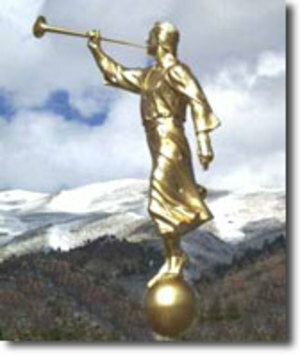 These are threatened by attempts to ridicule and “other” Mormonism as a faith and to tie the political beliefs of Mormons to Romney’s own political beliefs.